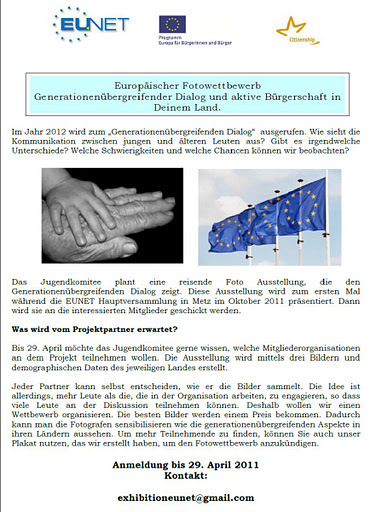 The project aims to create a photo exhibition expressing what the intergenerational dialogue looks like in European countries. This exhibition is thought to be presented for the first time at the General Assembly of EUNET in Metz October 2011. In the following months the exhibition will be hosted by the partner organizations that would like to use it. The Exhibition will consist of a portfolio of photos and descriptive texts. The exhibition will in addition be available on the internet. What is expected from the partners of this project? 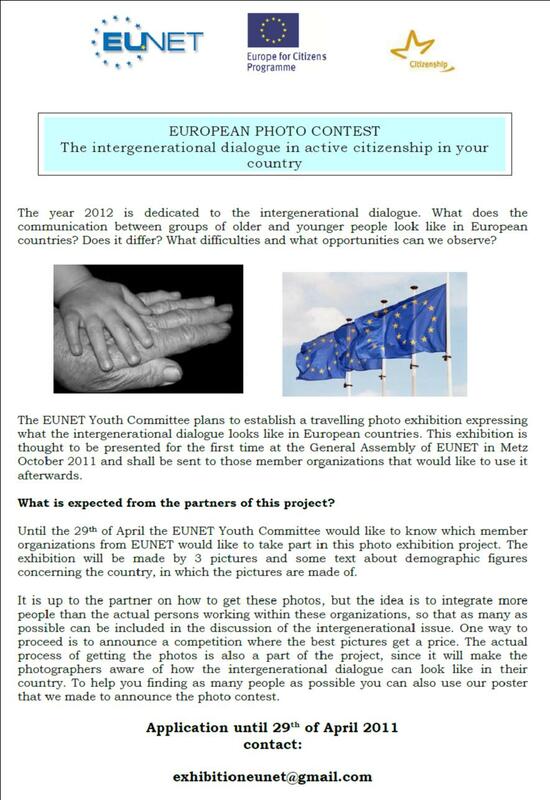 Until the 29th of April the youth committee would like to know which member organizations would like to participate in this photo exhibition project. The deadline for handing in the three pictures and descriptive texts is the 10th of September. The pictures should be loosley connected to issues surrounding the issues of intergenerational dialogue. The descriptive texts should provide a short history of the “pictures histories” and the thoughts behind them, as well as information about the demographic situation of the country in which the pictures were taken.